Chemi-Pure Elite-Chemical Filter Media is the clear choice for maintaining the optimal environment for aquatic life. It balances pH levels, removes nitrogenous waste, and leaves water ultra-clear. This formula has ferric oxide to help remove phosphates and silicates. Chemi-Pure knows you value your fish as much as some people do their cat or dog. That’s why the company’s products are carefully researched and tested to ensure your aquatic friends have a long and healthy life. Chemi-Pure’s product line is a simple way to keep your aquarium sparkling clean and the water perfectly balanced. 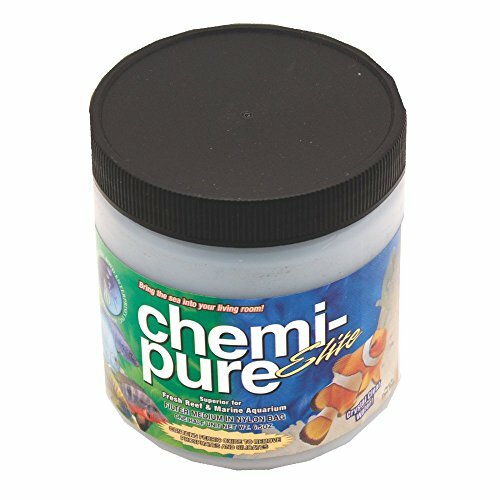 Whether you have a freshwater or saltwater set-up, Chemi-Pure is here to help you effortlessly maintain your underwater environment. Multi-purpose chemical filter for aquariums. Removes nitrogenous waste, phosphates, and silicates. Keeps pH at a safe range. Keeps water clear. Lasts 4-6x longer than average carbon. 6.5 ounces treat up to 20 gallons, 11.74 ounces treat up to 40 gallons . With the exception of aquarium water conditioner and aquatic plant liquid food, I am not a huge fan of treating aquarium water perimeters with chemicals. I find that regular water changes, an array of natural aquatic plants and a few detritus removing snails can accomplish the same goals.